Going out should get easier by obtaining that unique vintage-flair quality footwear from this section. Flats, heels, ballerina shoes, boots, sneakers, or platform shoes for daily wear, evening parties, or formal events provide a variety of choices. You can find here leather or fabric shoes narrowing further the pair of shoes destined for the checkout cart. Secured checkout and fast delivery will unite you with desire footwear only in few days. Relax ARA Germany Flex platform shoes in tan leather, heel, sz 7.5 G.
Tommy Hilfiger black slip ballet flats shoes with emblem accent, sz 7. EKSBUT Italian red leather laced up shoes, sz 38 EU. AK ANN KLEIN slip on tan color suede shoes with front accent and small heel, sz 8. HALOGEN, pointed toe black and spotted accent leather ballet flats, sz 8. ENZO ANGIOLINI red leather heels sz 7.5, Eazabrina design. GUESS LOGO kitten heel and pointy toe elegant shoes, sz 7-1/2". Cutter Buck women's golf shoes, sz 8.5 Leather upper and lining. SOFtSPOt pillowtop technology shimmering black and charcoal leather clogs, sz 11M. 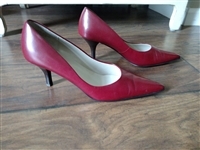 Anne Klein AK leather, Burgundy, kitten heel pumps. 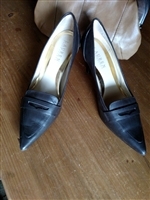 VERA WANG and ATHENA ALEXANDER shoes set of two in women sz 8. Women's slip-ons/clogs style comfortable shoes. Sz 40 Euro. COACH logo low top Francesca sneakers sz 8 B.
Vintage Antonio Melani, spool heel, ankle boots in black leather. Alegria professional shoes, sz 9 US or 40 EUR leather upper. 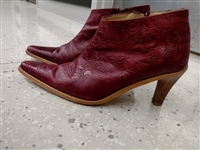 Dexter leather cowboy boots sz. 8-1/2. 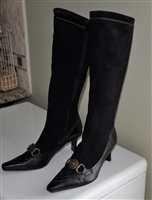 Ralph Lauren pumps in darker brown leather finish. Sz 6 md. 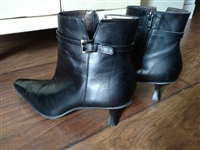 Nine West long leather boots, sz 9 women.